Heat oven to 350°F. Line cookie sheets with cooking parchment paper. Using food processor, process coconut until finely ground. In large bowl, stir together coconut and cookie mix. Add sweetened condensed milk and almond extract; mix well. Mixture will be crumbly. Stir in cream of tartar. In small bowl, beat egg whites with electric mixer on medium speed until soft peaks form. Fold egg whites into cookie mixture. Using 1 1/2 tablespoon-size cookie scoop, firmly pack with coconut mixture and place mound on cookie sheet. Repeat with remaining coconut, placing mounds 2 inches apart. Press each mound to flatten slightly. Bake 8 to 10 minutes or until edges just begin to lightly brown (do not overbake). Cool 2 minutes; remove from cookie sheets to cooling racks. Cool completely, about 15 minutes. In 1-quart nonstick saucepan, melt chocolate chips and shortening over medium heat, stirring until chocolate is melted. Dip each cooled cookie halfway into melted chocolate, letting excess drip off. Place on sheet of parchment paper; sprinkle chocolate portion with nuts. Let stand until chocolate sets, about 1 hour. Store between sheets of parchment paper in tightly covered container. "I was at a 50th anniversary party and was served a macaroon that I really liked. 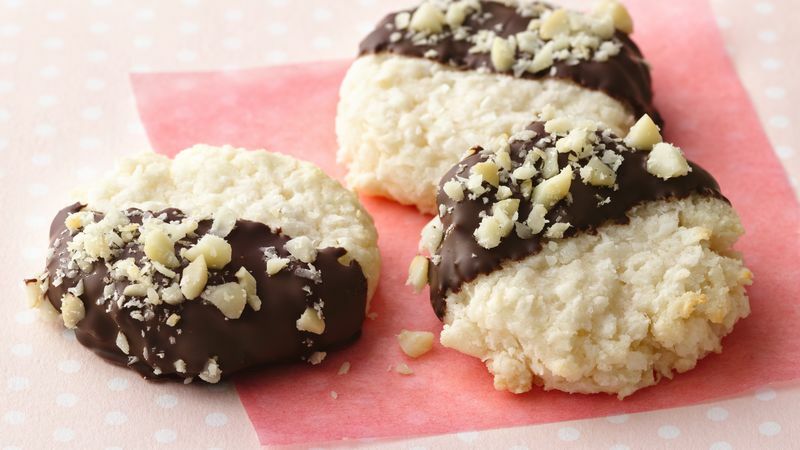 I recreated this cookie using a Betty Crocker cookie mix." Line cookie sheets with cooking parchment paper for even baking, no sticking, and no cleanup.